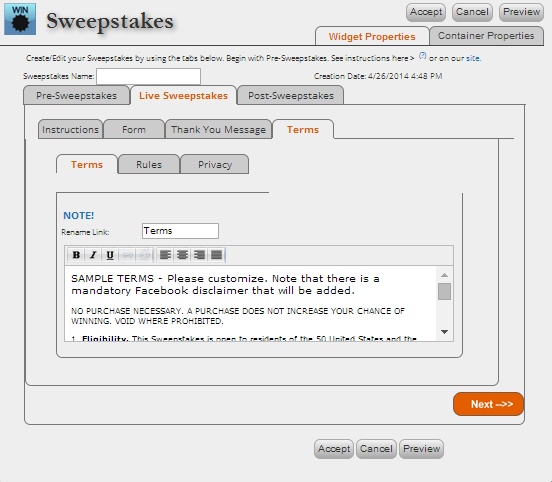 TabSite is pleased to offer Sweepstakes for use on fan page tabs. 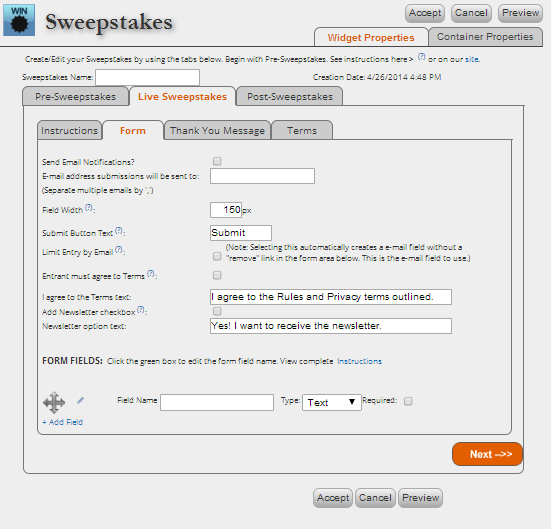 Sweepstakes allow visitors to submit entries during a promotional time period. Each entry is e-mailed to you. From the entries you can pick a winner. TabSite's Sweepstakes is fully compliant with Facebook's Promotion Policy. 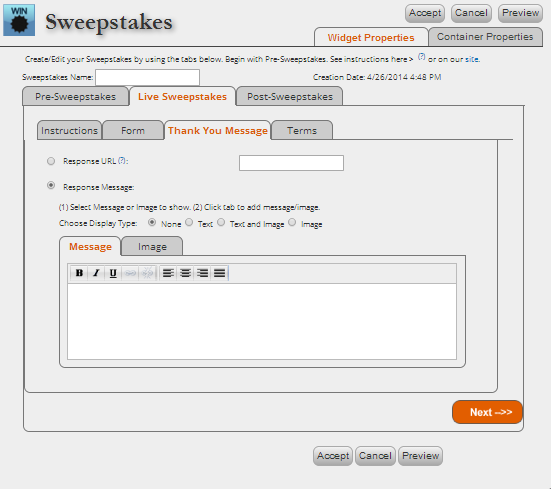 First, TabSite users should go to the TabSite manager and on the tab that you want to have the Sweepstakes on, we recommend you use the TabSite widgests and tools to create your page layout, background, header, footer, etc. Then where you want the Sweepstakes to appear on your fan page, drag the Sweepstakes widget (shown here) to your page from the Widget area. Container Properties tab - This is where you set background color for your sweepstakes widget, as well as text and link colors. Note if you have a overall tab background set, the widget will inherit that by default. You can override by using this feature in the widget. Enter the Start Date by clicking in the field. This will open a calendar where you select the date. 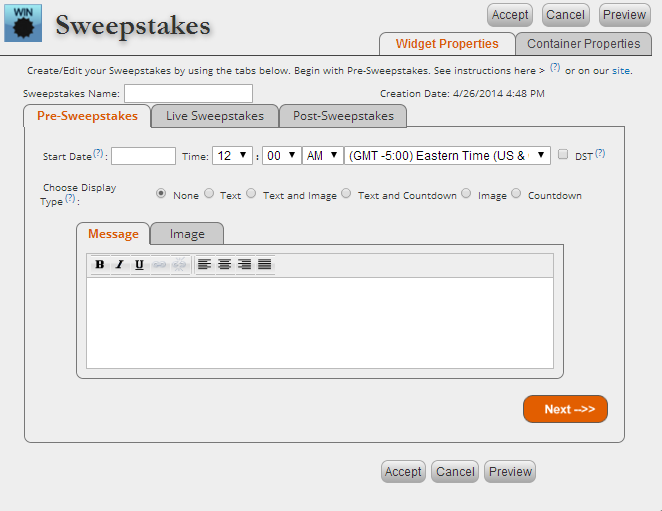 If no date is selected, the Sweepstakes will start and be available as soon as you save and publish the page. Proceed to the right and set the time, and time zone to use. INSTRUCTIONS: For instructions, you have the option to deliver this as text, text and a image, or simply a image. This will appear above your form on the tab. Choose an option in the "Choose Display Type" line and then use the appropriate tab for Message or Image. At any time you can use the "Preview" button to switch to the preview mode for that area. FORM: First, enter the e-mail address that you want the form submissions to deliver to. We recommend you type this e-mail address in. (NOTE: We can't guarantee delivery to all e-mail addresses as thngs such as your spam filters can impact this. Please test!) Below this is the "Field Width" which is how wide your form fields will be to fit well within your design. They should never be larger than 480 px to allow room for the field name. You then have the option to rename your "Submit" button, so if you want to say "Enter!" you can, etc. Currently there is no storage of submitted entries, they are simply delivered to you via e-mail. We will add a storage and export feature in Phase 2 of Sweepstakes tentatively planned for summer 2012. To change a field name in your sweepstakes form, simply click on the green box with the pencil icon it it. This allows you to rename the field title to whatever you choose. Click the "Add Field" link to add a new field and use the arrows to reorder your fields. The field types can be a simple text entry field or you can select to make it a "Comments" field to allow easier input of more text. Check "Required" if you want the form field to be a required field that must have input in order for submission to occur. Once complete, proceed by clicking "Next" or going to the "Thank You Message" tab. Statement that is always at the top of terms: "This promotion is in no way sponsored, endorsed associated with, or administered by Facebook or the App Developer of this Sweepstakes. Your entry affirms you understand you are giving a complete release to Facebook and the Developers of this App and that you are not providing your information to Facebook or the App Developer." POST SWEEPSTAKES: (see image below) This is where you set the End Date of the sweepstakes which removes the "Live Sweepstakes" form submission from your fan page tab. If no end date is set, then the sweepstakes will run indefinitely. Select method of message in "Choose Display Type." 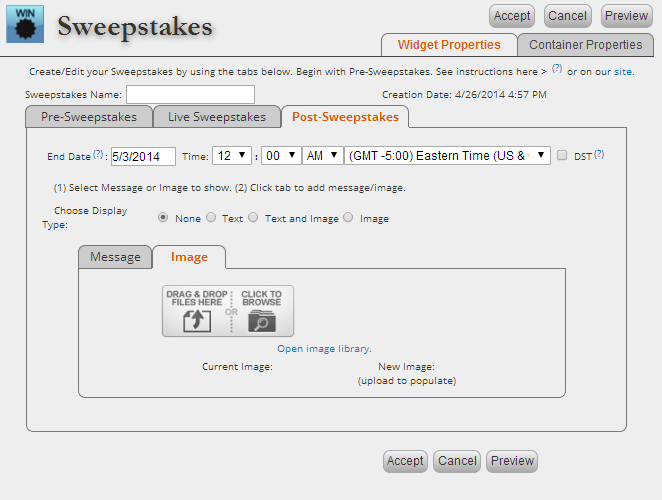 Note: You have the option to outline a message (text and/or image) to display to visitors after the sweepstakes entry time has closed. Use relevant tab based on selection above to add message and/or image. 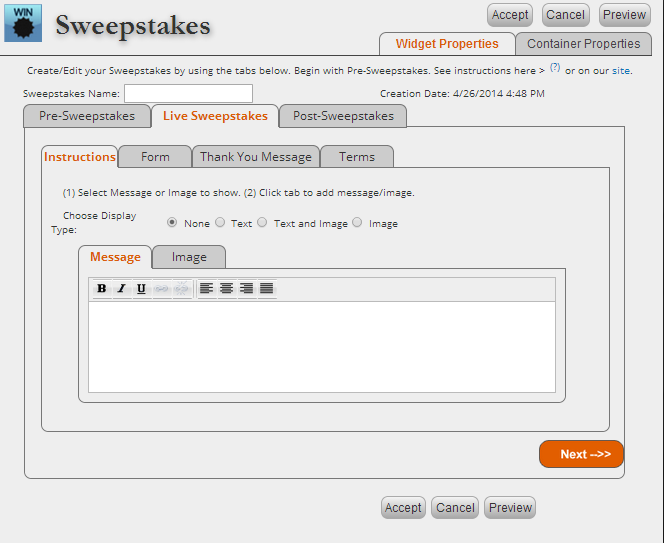 PREVIEW: There is "Preview" button at the top and bottom of the Sweepstakes portal enabling the TabSite Manager to click through Pre, Live, and Post tabs to see each view of the sweepstakes. If one area is not shown, check the "Choose Display Type" in that area back in the edit mode to ensure you have it set appropriately. Once complete, make sure you select "Accept" to save your Sweepstakes widget updates and then on the page tab, you need to use one of the "Save" functions to save the updates to your Page tab (see below). Lots of POWER, lots of flexibility, loads of ways to customize to create the sweepstakes you want! To promote viral sharing we recommend using the TabSite "Share", "Send", "Like", "Tweet", and "Google +1" widgets on the sweepstakes page and consider using the "Unlisted Sub-Page" option as your "Thank You" url so you can customize the thank you and have all the social sharing tools right there for users to select on the "Thank You" page! Your Sweepstakes winner is yours to determine from those who have submitted entries. There is not a winner generated for you. Launch a TabSite Sweepstakes today!